Zoey Verma, Third Ranker from the Bottom and Virtually-Unemployable, has managed to land a job! Management trainee and first-time employee in the fridge-manufacturing giant J & K Ltd, Zoey is clueless about where her life is headed. She has barely managed to pass out of B-school when fate pushes her into another whirlpool. And, a look at her own fridge will confirm that she has no fascination for them. The tall, thin, frizzy-haired Zoey enters J & K shaky-legged. And, when her scary boss Wimpeater sends her to the company's seedy Delhi branch to map all the consumer durable outlets in the city, her life goes into overdrive. Chances of it stabilizing seem slimmer by the day as she dodges gaalis from the Delhi boss, Chhota Don and fends off lecherous looks from distributor Shady Singh, all the while evading her clingy ex, Velcro Man. Then, just as she finds herself on the brink of a nervous breakdown, she is sent back to Mumbai. The move turns out to be a plunge from frying pan into the fire as Zoey becomes a victim of dipping sales and growing slurs, forcing her to ask questions so existential, even Kafka would be impressed Read on to find out how Zoey finds her way back to what she wants, both personally and professionally. Sarika Pandit lives in Mumbai but zips out of the city whenever pangs of wanderlust strike. When she is not travelling, she splits her time writing and working as a market research professional. Her travel articles have featured in publications such as The Times of India, National Geographic Traveller, Mint, The Pioneer, Deccan Herald and Femina. Her first book, Bucket List of a Traveloholic, a travelogue was published in 2014. Fresh out of college we all have so many dreams and aspirations about our career but at the same we are equally confused about what do we really want to with our lives in terms of jobs. Due to this we end up taking up jobs that are available and end up cursing every day of our life. Little do we realize that is it just a simple case of being a Misfit! 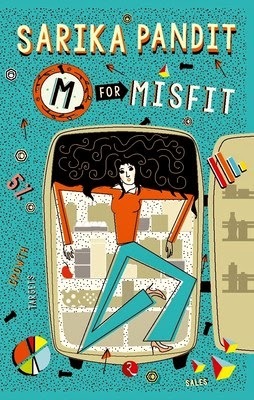 Sarika Pandit’s book M for misfit captures this confusion very aptly making it a hilarious read. Having read the author before I can vouch for that the fact that with each of her books the author is growing! I loved reading this book for various reasons – one of the biggest one being the light hearted read this one turned out to be. When I read the blurb I was expecting a story with a lot of management gyaan served to me, but the magic of the author *sigh* she makes it such a wonderful read that I was smiling all through the last page. The beauty is the simplicity in the whole book. There are many characters but not all have names, rather they are given special identification marks making it easy for readers to not only visualize them but also not bother about remembering the names. Something as simple as Trainee no. 1, trainee no. 2 does the trick. And trust me when I say it no way hampers the narration of the story. Rather the narrative just gets a little funnier because of this. Mind you, before you conclude that this is a chick lit let me clarify this is not a chick lit, I cannot categorize it into it. I would rather call it a coming-of-age book for grownups! The story line is very simple; minimalistic without any steep ups and downs, but the language is what takes your heart away. You laugh at many places and for someone like me you are actually nodding your head to a lot of situations and sentences there in which describe the corporate life so well. I loved reading this book for the smiles it brought my way, for the déjà vu feeling it evoked in me and most importantly the ‘you-are-not-alone’ message it whispered in my ears every time I read about Zoey. A recommended read for all people who love laughing, enjoy light reads – this is a perfect weekend read which will pep up your dull afternoons like anything! 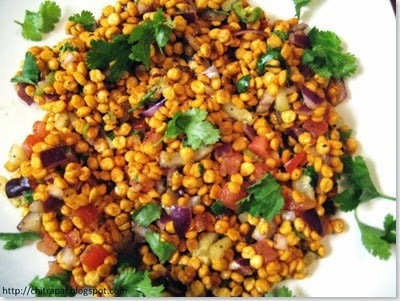 This book islike chana dal chaat - delicious, tongue tantalising and tangy!